Hello everyone! 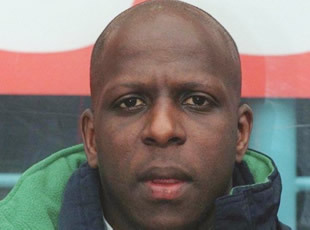 I’m former Liverpool and West Ham United forward Tweety Camara, and I’m a right nosy so-and-so. LOL! Thanks, Robbie! And good morning, everyone else! How do you like to get the day underway? I love a good Monday morning shower dance myself, Eboue! But I’m more of an ELO/Jamiroquai kind of guy – well, just ELO ever since I slipped in the shower trying to do the dance from the “Virtual Insanity” video. I ruptured two Achilles ligament strings and three metatendons. For my Tuesday morning showers I click my fingers and croon a medley of Rat Pack-era classics, while on Wednesdays I conduct imaginary press conferences where I’m the national team manager of my native Guinea. I refrain from showering on Thursdays, and then over the weekend I tend to take baths. In case you were wondering, my favourite ELO song is that one that goes “missed a blue sky”. That really speaks to me. Warren, I hear someone found a toy of you? “@johnrob79: Was havin a clearout and found @warrenbarton2 don’t worry zico u survived the cull twitter.com/JOHNROB79/stat…”thank you great hair..
LOL! It looks just like you, Warren! The one they made of me was a disaster. It looked like a fat Jay-Z. Do you have any stories for me this week, West Ham co-owner David Gold? And Kevin Keegan called out, hi David how are you doing, WH are going well aren’t they, yes I replied but didn’t mention our last result. That sounds like a neat story, David, but I didn’t catch the first part of it. Where did you bump into Kevin? Hmm, that was funny. What have you found funny lately, former Soccer AM presenter Tim Lovejoy? Alan Hansen hammering everyone on MOTD for not scoring was funny. LOL! I didn’t think it was funny. See, it upset Jason! Did it get to you too, my former teammate Michael Owen? my #Movember that was the problem! Oh well, only 3 weeks to go before the top lip is hairy no more. …hmmm. “Your face?” – that’s what I should have said. We used to have some great banter back in the day, didn’t we Michael. LOLOL!! Take that, Michael! How was the Lionel Richie concert, Carlo? Yes, that one. In fact, “Three Times a Lady” was the principal inspiration behind my run of three goals in three games against Southampton, Bradford City and West Ham in my early Liverpool days. I was like Pele in training around then, just ask Jamie Carragher. See? I attribute my subsequent dip in form to Don Hutchison introducing me to the pancakes at Gyms Kitchen. That really was the beginning of the end. By the time I linked up with Don at West Ham we were going together frequently – lunch, dinner, more and more pancakes. Would West Ham have escaped the drop had Don and I lain off the pancakes? It’s impossible to say. I surely must be on a percentage!! Just spent an hour bumming @gymskitchen up to the girls at the gym in repton!! Free pancake for hutch?????? LOL! Cut it out, Don! What have you been up to, 5 Live presenter Mark Chapman? Just nodded hello to a woman I thought I knew. I didn’t know her. It was Mrs Warboys from One Foot In The Grave. LOL! I once high-fived Dorian from Birds of a Feather because I thought she was my friend’s mum. She seemed to think I was someone else, too. Someone called Alan. We both played along for at least an hour, even ended up going for dinner with each other. Funnily enough, Swansea City winger Wayne Routledge was the head chef there at the time. He made us the most divine…what was it, Wayne? Mmmm, that all looks delicious, guys! As for Mark’s ice cream man: LOLOLOLOLOL!!!!!!!!!! “@nikkalastott: In the car wash and look what I found @andygoldstein05 !!! twitter.com/nikkalastott/s…” CHUBSTER!! “@thisispayney: Ok. Please help settle an office debate: Was there any luck involved in Ibrahimovic’s fourth goal last night ?” Pure skill!! LOL! I see you’re an oracle now! LOL! I’ve always thought you and Matt Lucas would hit it off for some reason. Similar sense of humour I think. I really want to watch my old Shooting Stars videos now. Yes, I still have a VHS player! I know, right?